May 23rd, 2012, added Sonnet Store links to Sonnet Pro 6G ExpressCards in WHERE TO BUY section. But you say, "I don't have any ExpressCards. Why do I need an adapter for one?" Think of it as a "gateway" to storage options other than an expensive "pure" Thunderbolt enclosure. Think of it as a way to use, for example, an eSATA enclosure you already own. So whether you already have an eSATA enclosure or you plan to buy one, the key question is, "How fast will it go if I connect it to the Echo Pro ExpressCard adapter with an eSATA ExpressCard?" Historically, the write speeds have been abysmal for most eSATA ExpressCards installed in the ExpressCard/34 slot in the MacBook Pro. This is especially true of the newest 17" MacBook Pro. Sonnet must have anticipated you would ask that question because they have come up with an impressive answer. Check out these four graphs before I say more. Enclosure used with the Echo Pro and eSATA ExpressCards was the FirmTek miniSwap/ES. The 6Gb/s SSDs used were the SandForce based TransIntl SwiftData Synchronous 6G 6256 models. The performance is on par with other SandForce based 6Gb/s SSDs like the OWC Mercury Extreme Pro and OCZ Vertex 3. Sonnet Technologies' Echo ExpressCard Pro Thunderbolt Adapter performs very well -- especially teamed up with Sonnet's new Tempo edge SATA Pro 6Gb/s ExpressCard/34 with single eSATA port. To dramatize the improved performance offered by the "Echo Pro + Edge 6G" pairing over previous eSATA ExpressCards, we included results for last year's Sonnet Tempo SATA 6Gb/s ExpressCard. Looking at the large sequential writes, you can see the older eSATA ExpressCard hobbles along at 81MB/s on our late 2011 MacBook Pro. Small random writes are slow, too. Write speeds on older eSATA ExpressCards are slow whether you use the MacBook Pro's ExpressCard slot or the Echo Pro. The slow writes are characteristic of all brands of 2011 or older eSATA ExpressCards -- not just Sonnet's. 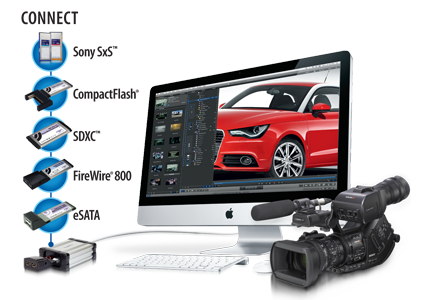 There are various "pure" ThunderBolt enclosures but the only single drive example is the Elgato -- so we included it. However, it suffers by comparison since it only comes with a 3Gb/s SSD. You could crack open the case and upgrade it to a 6G SSD, but only certain asynchronous SSDs like the OWC Electra will work. Putting a single 6G SSD in the Promise Pegasus R4 will get you to 450+MB/s but that four bay RAID box would be a very expensive single drive solution. One other reference point is to compare the performance of the MacBook Pro's internal factory SSD to the Echo Pro. Since the Apple factory Samsung SSD is only a 3Gb/s, it's slower than the Echo Pro + Edge 6G setup with a 6Gb/s SSD. But if you upgrade your 2011 Mac with a 6Gb/s SSD, you will see 500MB/s on large sequential transfers. As you can see, we included results for both internal SSD scenarios in the graphs. The Echo ExpressCard Pro Thunderbolt Adapter with the Edge 6G card DOES support booting of OS X. It can be used with any Mac that has a Thunderbolt port including the iMac, MacBook Pro, MacBook Air and Mac mini. 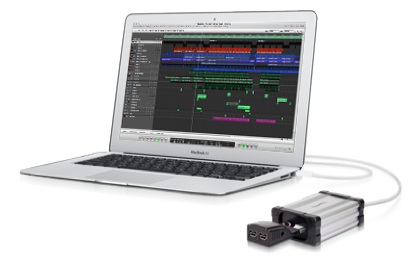 There is a bonus for you owners of MacBook Pros with an ExpressCard slot: The new Sonnet Tempo edge SATA Pro 6Gb/s ExpressCard/34 inserted in the MacBook Pro''s built-in ExpressCard/34 slot does sequential reads and writes just as fast as when it is plugged into the Echo Pro -- making it the fastest eSATA ExpressCard available. More good news. Sonnet will soon be shipping new "sister" ExpressCard to the "Edge 6G" called the Sonnet Tempo Pro SATA 6Gb/s ExpressCard/34 (not listed on their website at this writing). With two eSATA ports, it will enable you to create a striped (RAID 0) or mirrored (RAID 1) pair of fast drives. We will post test results for it as soon as we have a sample in the lab. WHAT ABOUT EXPRESSCARDS OTHER THAN ESATA? The Echo ExpressCard Pro Thunderbolt Adapter supports other ExpressCards such as the Sonnet FireWire 400/800 and USB 2.0 ExpressCards. It also supports Sonnet SDXC UHS-1 Pro Reader/Writer and Pro Dual CompactFlash Adapter, and Qio E3 3-card/device expander. The one exception: At this time the Echo Pro does NOT support USB 3.0 ExpressCards -- and future support is uncertain. To see all Sonnet and Third Party ExpressCard related products that work with the Echo Pro, click the "Compatible Products" tab on the Echo Pro and Echo product page. We are almost finished testing the LaCie Thunderbolt-to-eSATA Hub. Look for that article to appear soon. Suffice to say that it has its advantages and disadvantages compared to the Sonnet Echo Pro Thunderbolt-to-ExpressCard solution. As you can tell we are big fans of 6Gb/s SSDs because of the speed they provide. We're also a fan of notebook drive enclosures like the FirmTek miniSwap/ES that provide a dedicated 6Gb/s rated eSATA port for each drive, thereby squeezing out the full speed potential. With the MacBook Pro being the top selling Mac, the interest in small, fast drives and drive enclosures is likely to surge along with those sales -- especially of prices of SSDs go down and capacity goes up. Purchase the Echo ExpressCard Pro Thunderbolt Adapter (model ECHOPRO-E34) direct from Sonnet's Online Store (currently in stock). The new Tempo edge SATA Pro 6Gb/s ExpressCard/34 (model TSATA6-PRO1-E34) single eSATA port is now in stock. The new Tempo SATA Pro 6Gb/s ExpressCard/34 (model TSATA6-PRO2-E34) dual eSATA port is now in stock. BE SURE TO SPECIFY THE MODEL NUMBERS LISTED ABOVE TO INSURE GETTING THE BEST PERFORMING PRODUCTS. See also Other World Computing for the Echo Pro and Dual Port 6G Pro ExpressCard.